On the first of March, the bishop visited one of the two communities in the village of Salquil Grande in the municipality of Nebaj, Quiché. A short time ago the community built a large church and now it is intensely committed to mission outreach. 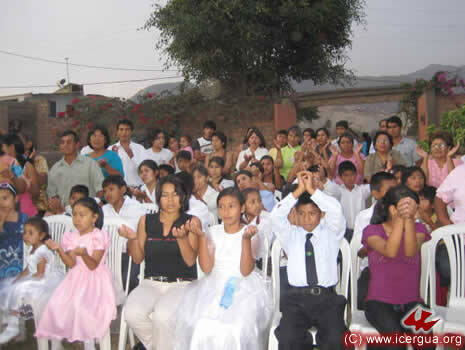 In the afternoon of the same day, in the context of a Eucharist observed in a section of San Juan Cotzal, Quiché, a community made an alliance with the ICERGUA communion. With this alliance, ICERGUA has a presence in the three cities that comprise the Ixil Triangle. It is a small community that is, in spite of its size, committed to give a mission witness to the whole municipality. On Friday, March 13, Monsignor Aguirre celebrated Eucharist in the communities of “Pentecost” and “Outpouring of the Holy spirit” in Santiago Atitlán. Baptisms were celebrated in both places, and in the latter a marriage took place as well. The communities are growing and their members are committed to work assiduously in mission outreach. On Saturday morning, March 14, the bishop celebrated Eucharist in two of the communities of Santa Cruz La Laguna. These communities, located in the upper part of Lake Atitlán, are working intensely. The community of Pajomel is preparing for its celebration in May of the anniversary of the arrival of the Holy Sacrament, for which it is putting the finishing touches on the church which it constructed, at considerable sacrifice, over these years. The Community of Chuitzanchaj is actively participating with other churches in the village in preparing the cemetery that will soon be inaugurated. In the evening of Saturday, March 14, our bishop presided over the solemn Eucharist with which the vigil began to celebrate the anniversary of the Community of “Los Guates” in San Juan Sacatepéquez. A beautiful tent had been prepared to house the 1500 participants who were present. Noteworthy was the presence of some 300 faithful from San Juan Comalapa and another 200 who came from various places to express their fellowship and solidarity with this community that has recently entered the communion of ICERGUA. The other 1000 participants are members of the rapidly growing Community of Los Guates. Father Rigoberto Upún, our Vicar General, was invited to preach at the vigil, which followed the celebration of the Mass. It was truly a feast of the Holy Spirit. 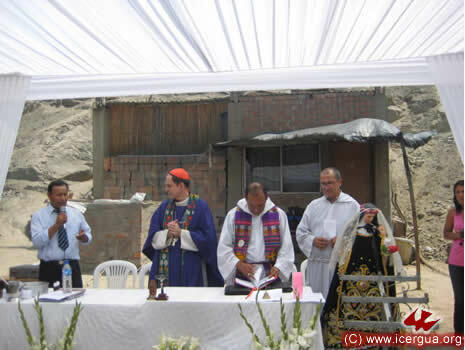 From the 19th to the 24th of March our bishop was in Peru, visiting the missions of ICERGUA there. 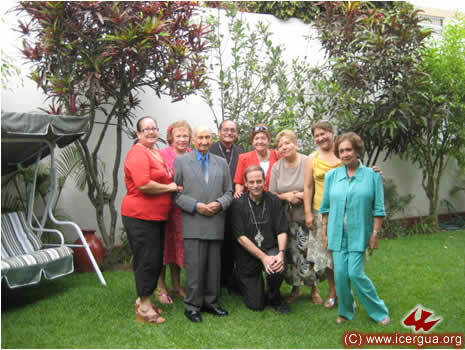 The Peru mission began September 29, 2008, after several months of discussion and a first visit by the bishop in July 2008. Then three presbyteries were incorporated into ICERGUA. From that time to the present, the number has more than doubled, as well as the communities that comprise the mission. The visit was full of pleasant surprises that show the selfless and generous outreach work of the priests in these places. On the morning of the 20th a meeting took place with the presbytery of Lima. Present were Mons. Jorge Isla, Father Gerardo Sotomayor, Father Juan Ernest Iriarte and Father Lucio, coordinator of the Presbytery of Huancayo. In the meeting the agenda for the Apostolic Visit was defined and various questions with reference to the successes of the mission were discussed. On the same day around sunset, the Chrismal Mass was held in the Parish of Zapayal. The place had been blessed by the bishop during his July visit. At that time there was only a building; a community did not yet exist. Now, thanks to the apostolic zeal of Father Gerardo Sotomayor, a vibrant community has been formed, and it is growing to the point that the Mass had to be celebrated in the patio next to the hall. Several baptisms, first communions and confirmations were celebrated within the frame of the Chrismal Mass. In the Chrismal Mass the three priests already incorporated into ICERGUA and Father Jesús, who is in the process of joining (and who was the photographer and therefore does not appear in any of the photographs), renewed their priestly commitments. At the end of the celebration many families joined together in sharing supper. In the Parish of Zapayal. From right to left: Father Gerardo (the parish priest), Mons. 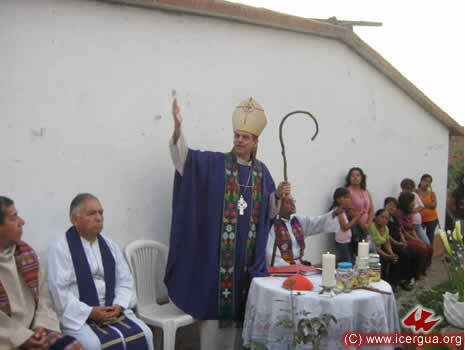 Jorge Isla; the bishop during the homily, Father Juan Ernesto and, at the back, some members of the Parish Council. Parish of Zapayal: Some of those who would be baptized and others who would receive first communion during a time of prayer. Zapayal: The Bishop addressing the the young adults who are to be confirmed. 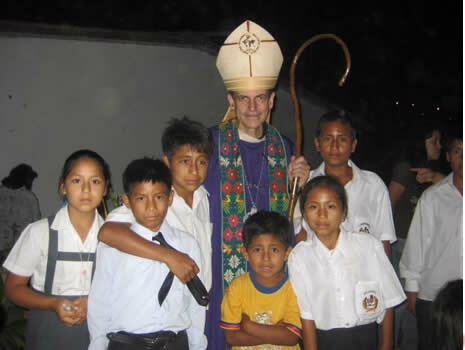 Zapayal: At the end of the celebration, the bishop with some of those who had received first communion. MARCH 21. MASS IN THE COMMUNITY OF SAN ISIDRO, LIMA. 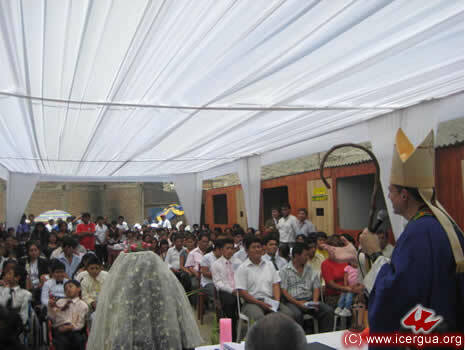 In the late morning of March 21, Eucharist was celebrated in the Community of San Isidro. This community, which consists of about forty people, meets in a member’s home chapel, where the Holy Sacrament has been present since July 2008. Above: Imparting individual absolu-tion to some of the participants in the celebration. 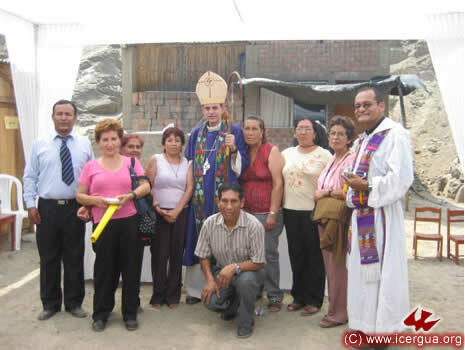 Right: The bishop with some members of the community’s team for revitalization At the right of the bishop is Dr. Gustavo Chávez, ex-president of Peru’s Supreme Court of Justice, and at the left is the judge’s wife. The see of the community is in their residence. The Coordination Team of the Community of the Sacrificed Lamb participated on Sunday in the Eucharist that was celebrated in Santa Rosa de Valle Nuevo. In front is Javier, Minister of the Communion, who had been installed the previous evening during the Mass. The communities of Los Santos Angeles have been stimulated by a faithful woman who has received special gifts and have focused in particular on devotion to the Holy Angels. There are other communities that share this spirituality in various parts of Peru. Eucharist was celebrated in the central community, many of the faithful participating. Also there is here a chapel specially dedicated to the Adoration of the Holy Sacrament. On Sunday morning, March 22, the site of the celebration was the Community Center of Santa Rosa de Valle Nuevo in Vitarte. Three hundred faithful Christians participated, including the director of the Community Center. Father Juan Ernesto has worked with enthusiasm and generosity and succeeded in constructing a College. However, according to the testimony of the inhabitants of Santa Rosa, the greatest success was unifying the community, which had been divided and scattered. Little by little the population had found its identity around Father Juan Ernesto and received new incentive to try to improve. Rodolfo, president of the Community Center, is looking forward to the bishop’s next visit for the celebration of marriages in the mission. On the occasion of the visit there were numerous baptisms, confirmations and first communions. Santa Rosa: Brother Rodolfo, president of the Community Center Board of Directors, is giving the official welcome to the bishop. Santa Rosa: Monsignor Eduardo greets the People of God at the onset of the celebration. 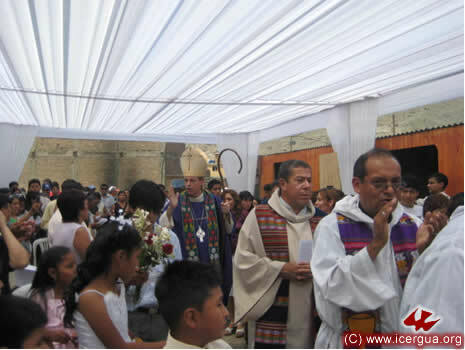 Santa Rosa: Among those who were baptized and received first communion, two boys were special. In the photo the bishop is baptizing Eduardo. 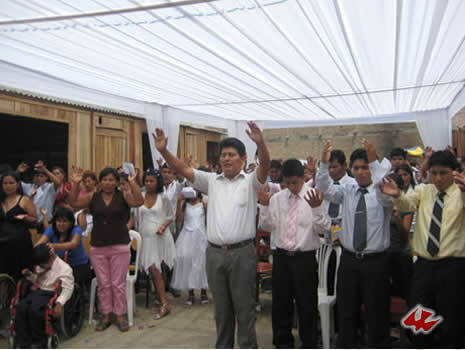 Santa Rosa: During the celebration Brother Florencio was installed as Minister of Communion to serve in the Vitarte area. 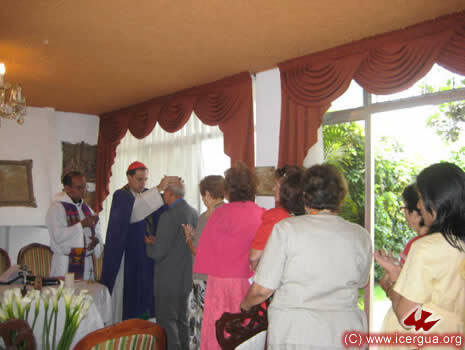 In the photograph, Monsignor Eduardo is receiving Florencio’s commitment to serve just before installing him. Santa Rosa: Some of the faithful, who are about to be confirmed, are praying intensely, preparing themselves to receive the outpouring of the Holy Spirit. On Sunday evening, after a trip of six hours and climbing 5000 meters in altitude, Huancayo was reached, where, in spite of the late hour, the community was awaiting Mons. Eduardo’s arrival to seal the alliance, celebrate the Chrismal Mass, ordain Father Lucio ad cautelam and ordain Luís as deacon. In this region there are three priests plus Deacon Luís who form the mission’s foundation of ministerial and pastoral activity. 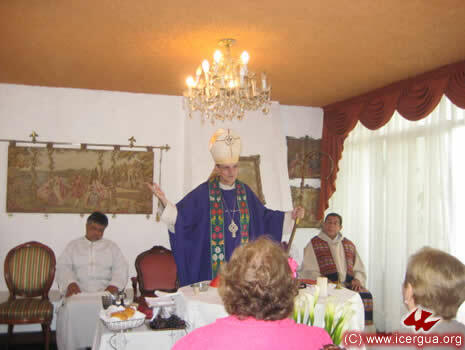 On the morning of March 23, the bishop met with the three priests and deacon of Huancayo. They shared their perspectives, and emphasis was put on the importance that the identity of our mission be centered on forming stable, participatory and mission-minded ecclesiastical communities. We are hoping that the community here will continue to grow and the fruits will be abundant. On the evening of the 23rd, Eucharist was celebrated in Lima. During it Marcos, an engineer, was admitted as a candidate for the deaconate. He is the nephew of Mons. Jorge Isla. His education and apostolic militancy have taken place primarilyin the context of “Franciscan Youth,” of which he has become the Latin American director. Now he has committed himself to complete his education, prepare for theological and pastoral examinations and do his supervised pastoral practice, and then proceed to deaconal ordination. 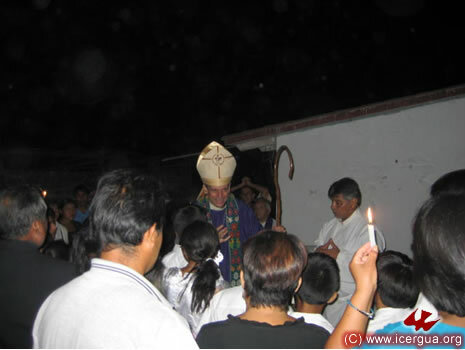 On Friday March 27, after visiting the Community of Jaibalito on the shores of Lake Atitlán, the bishop celebrated confirmations in the Community of Xolbé, Sololá. Twenty faithful Christians received the sacrament. They had been carefully prepared by the community’s leaders with the help of seminarians who periodically help with instruction in the community. This year the School of Theological Instruction for the People of God has received a new impulse. It its central location at the Ministerial Education Center in Huehuetenango there are forty new students. In both the Nebaj and Chajul sites there are about twenty. In addition we are in process of establishing instruction in Barillas and Santa Eulalia, which can, step by step, be incorporated into ESTYMLA. It is clear that the brothers and sisters are becoming more and more aware of the urgent need for appropriate instruction in order to be able to respond to all the spiritual, pastoral and mission outreach needs. The teachers in ESTYMLA are seminarians: Pedro Martínez (coordinator), Juan Moisés Mendoza (secretary), Marco Tulio Calderón (spirituality) and José Armando Hernández. 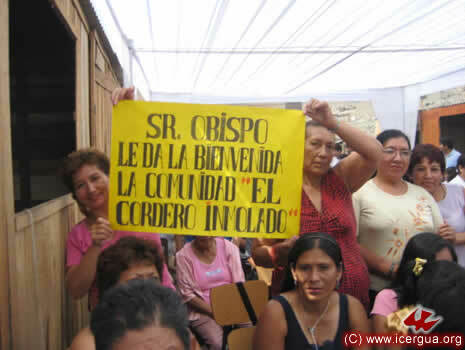 On the morning of March 28 the bishop celebrated the blessing of the beautiful church that the faithful of the Community of Onlaj, Concepción Huista have built. 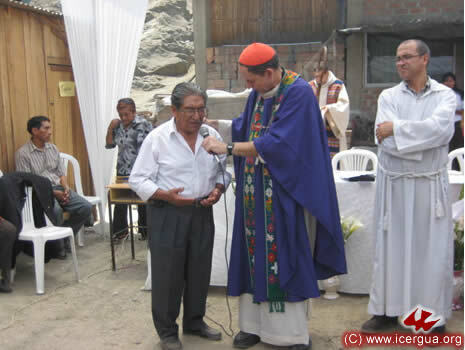 The cost of the church is reported as 225,000 Quetzals, contributed entirely by the members of the community. The lovely church is prepared to be the central site of the next parish for the municipality of Concepción Huista. Brother Benito Ramos, leader of the community, carried out the work marvelously, with care and deep spiritual discernment, achieving consensus and the harmonious participation of all the members of the community. On the evening of the 28th, Mons. Eduardo celebrated Eucharist in the central community of Jacaltenango. This community has recently gone through some difficult times, but is now clearly in a state of growth. More than 200 brothers and sisters attended the Eucharist. Numerous baptisms were celebrated. The participation of all the members of the community was joyous and enthusiastic. Tzisbaj is a community that made an alliance with ICERGUA only three moths ago. Nevertheless, it has already grown remarkably, and its enthusiasm and organization are marvelous. The bishop celebrated Eucharist in the community hall. There were 500 brothers and sisters participating. A third of them came from nearby communities, and the rest were local. Confirmations were celebrated. Particularly noteworthy is the participation of young people. They are well organized and have taken on a commitment of mission outreach to the whole municipality.